Aalayam - Colors, Cuisines and Cultures Inspired! : Spotlight on Contemporary Indian Design - the India Circus story and a giveaway! 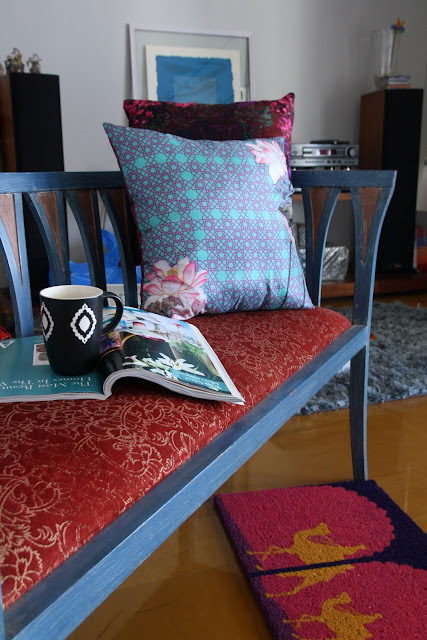 Spotlight on Contemporary Indian Design - the India Circus story and a giveaway! So, what comes to mind when you think of Indian decor ? Vibrant colors, dark wood tones, ornate motifs, intricate details, handicrafts ? 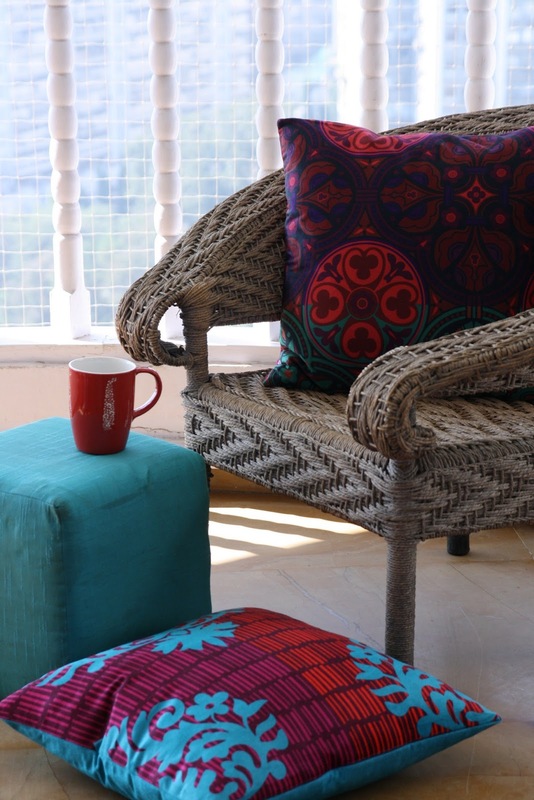 How about quirky, contemporary and chic accents with a hint of ethnic India? Mixing functional decor elements with a global vibe and incorporating a touch of India is in! Modern design sensibility calls for a marriage of traditional and contemporary and the India Circus team has recognized and accomplished this with their gorgeous array of products. In their own words, "India Circus seeks to curate the essence of life in India, and transcribe this loud and colorful experience into contemporary and sophisticated style. From luminescent lamps to totes a la mode, we have a lot to offer for various corners of your life! The vibrancy of the colors combined with the nuanced heritage of the designs makes each piece created at India Circus exceptional. All of our creations offer sophistication with a dash of 'Indian-ness,' without draining your wallets "
Home is where the heart is - a place where we grow roots and make memories! We call our homes a sanctuary and a haven. We add little touches to make this space our very own and invest a lot of thought and effort in this process. At Aalayam, we like to bring you inspirations for your home and life and today we shine the spotlight on India Circus as a tribute to contemporary Indian design. "Home accents or accessories are a cost effective and easy way to add color, whimsy and glamour to your living or working space. Like this wire stool for instance. What a fabulous way to add that touch of interest to a room! 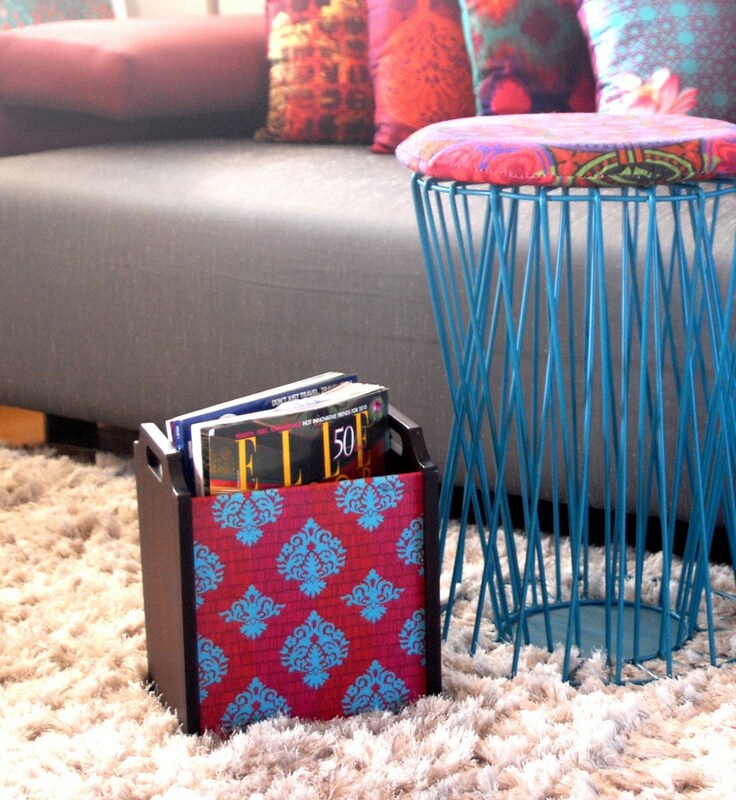 It is paired inventively with the block print magazine bin! Perfect for a serenity nook full of good reads! The stool is multi-functional too, need a spot to place your coffee mug? Just grab it close to you. Got one guest too many in your impromptu dinner party? Pull up the stool my friend! When we lived in an apartment, I had my own studio which I used to freelance from. This was a nook that I had decorated to my fancy, with quirky accessories that I had unearthed during my antiquing adventures or had picked up during my travels, much to my husband’s chagrin! 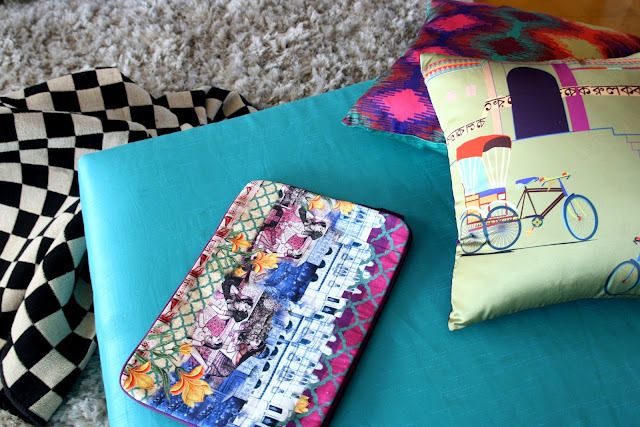 Very like the exotic laptop sleeve and the rickshaw motif cushion covers showcased here! These accessories definitely would be sure-fire culture conversation starters with my clients! Whenever I travel for work or for pleasure, I always incorporate some “India-inspired” accessories into my ensemble. Of course! Be it a vibrant clutch, a capricious tote, or even a funky umbrella. What better way to add my own personality into my outfit? After all, I cannot speak to everyone I meet, yet, I can communicate that I am a girl with some fierce opinions! Speaking of umbrellas, in my home, I have a caddy full of fun and vivacious umbrellas at the entryway. So, rain or shine, me and my guests are prepared to meet the quirks of nature!" Supriya and I have our favorites at India Circus. Make a trip to their online store. We urge you. Who knows what you might find? There's many stops on this decorating journey, let India Circus be your next one! Aalayam is 45 posts old! We are now a close - knit family of 104 and for this, we consider ourselves blessed! We wanted to pause and thank you for making this such a wonderful experience for Supriya and me. We teamed up with India Circus to host a giveaway - if it were up to us, we would send a little something to all of you but that is not be. However, one of you will take home this wonderful product that Supriya and I lovingly picked. This gorgeous tray with the crimson paisley motifs and the darling blue birds! Don't you love it? 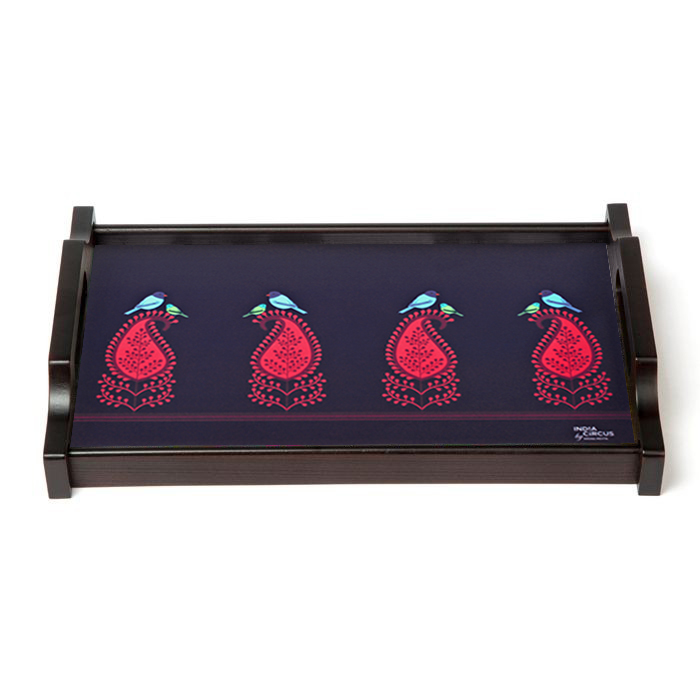 To be eligible to win this gorgeous tray, pick an option, follow the steps and leave a comment on this post saying which option you selected. Remember, every option has two actions, that you MUST complete to win! 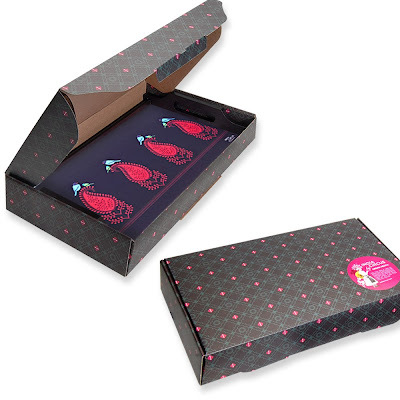 Don't forget to leave a comment on this post telling us which Option (1, 2 or 3) you chose, so we know you did what you had to do to win this gorgeous tray!! The giveaway is open to readers based in the United States and India till May 17th, 9 pm Eastern Time (US). If you live elsewhere, you can still enter provided you give us a shipping address in the United States or India (consider entering on behalf of a friend or family member) and the winner will be announced on the 24th. And stay tuned for more India and more inspirations! p.s: All images are copyrighted by India Circus. OMG!This is fanastic..Always love a giveaway but this one is fabulous.. Yes yes,please..liked on google:) Also just shared on facebook and I plan to do a blog-post soon..will leave you another comment then..
Have been following your posts & love the vibrant combinations.you choose.....most of all well put together..descriptions too !! Have chosen option 3......all the best & look forward to seeing more of your gorgeous stuff ! Suppi! I pick option 1 and I hope your blog makes it big! Hi Supriya and Deepa,I've been following your blog for some time now!I enjoy going through your posts!I've selected option 1 and have 'liked' and left a comment on the FB page of India Circus.This brand isn't new to me as I have bought their products.They are indeed colourful and quirky in every sense of the terms! Excellent writing as always...once again inspired to change things around the house, add a splash of color here and there...bring some "Spring" into the house...Thanks Deepa and Supriya for sharing these joyous moments with us...Option 2 it is!!! Joined this site via GFC. This is fab! Thank you for hosting this ladies. I chose Option 1.
and liked the facebook page of indiacircus. I chose option 2. Indiacircus got nice collection. I chose option 2 . Loved the tray n congrats on a great blog! This is fabulous! I chose Option 1. Newly introduced to this blog and IndiaCircus. Thank you for hosting this. I wish I could participate - Is this still on??? I love Krsna Mehta's stuff! Absolutely!! The contest is open for another week. Good luck! Thank you Sripriya! :) Appreciate you spreading the word.